ONLY SHARES THAT UTILIZE THE SHARE4SCHOOLS SHARING WIZARD WILL BE CONSIDERED OFFICIAL ENTRIES FOR THE RANDOM DRAWING. The Share4Schools Sharing Wizard authenticates the user’s valid social media account and your school in order to track the correct school account is credited for the share and the user is only allowed one share per account. Any form of sharing, re-sharing or hashtag sharing outside of the Share4Schools website cannot authenticate a connection between the user account and your school. These marketing flyers can be added to your current communication. There are complete flyers with marketing content and options with just the image so you can add to your image editing program to add your own text. Click the image to open the full size and then save. Ask for support with every email you send. As part of your email signature, add the Share4Schools banner and/or a call-to-action—remember to make it personal with the school name and mascot! Help us win $1,000 for [Item – New computers, books, etc.] 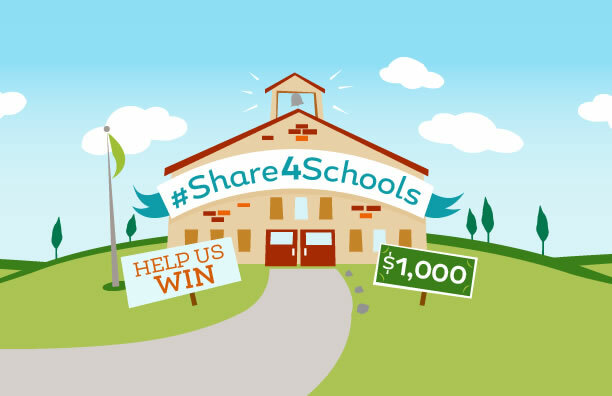 Visit Share4Schools.com to find out how! Share, Share, Share – All we need you to do is Share. 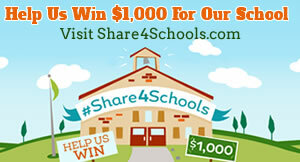 Visit Share4Schools.com and Share today! Do you want to easily help [Mascot] win a $1,000 towards new [Item]? Simply visit Share4Schools.com. Sharing is Caring….and potentially $1,000 toward [Item]. 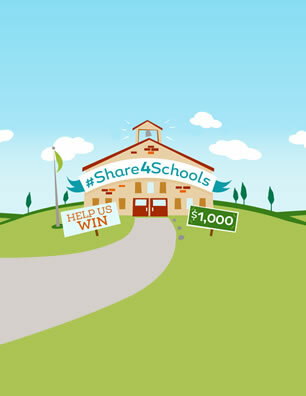 Visit Share4Schools.com to find out how! 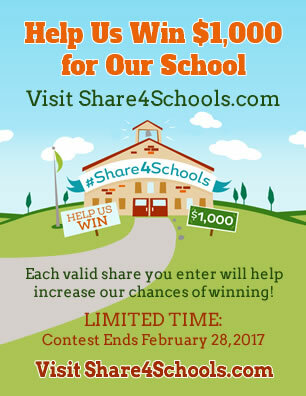 Help us win $1K for [School Name] – visit Share4Schools.com by 2/28/2017 to find out more. We have a chance to win 1,000 bucks for our school! All you have to do is Share by 2/28/2017. 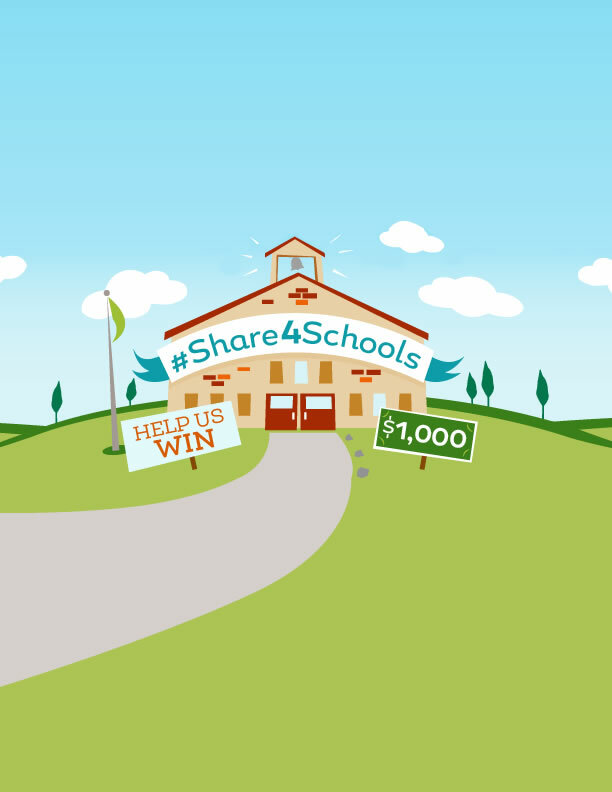 Visit Share4Schools.com to find out how! 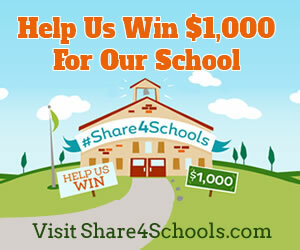 Please join us in trying to win $1K for [School Name] - Visit Share4Schools.com to find out how. These digital banner ads are pre-built to standard banner ad sizes and perfect to add to your website. Click the image to get the full size banner or use the code.